When it comes to finding a trusted builder for your home, these are the good guys — the members of the Dallas Builders Association. As you know, I am very fond of these guys and gals — many are my CandysDirt Approved home builders! And I am tickled pink that my friend Jeff Dworkin, CGP, of JLD Custom Homes, will be installed as the 71st president of the Dallas Builders Association Sept. 27, this Friday. The Installation is presented in partnership with Texas Capital Bank, title partner. I will be there in my dancing shoes. We plan to congratulate all the new board members, celebrate and dance the night away down at the Belo Mansion. Frank Murphy of Wynne/Jackson Inc. will become the DBA’s 1st vice president. Donnie Evans of Onyx Homes is the new officer on the ladder, serving as vice president/secretary. 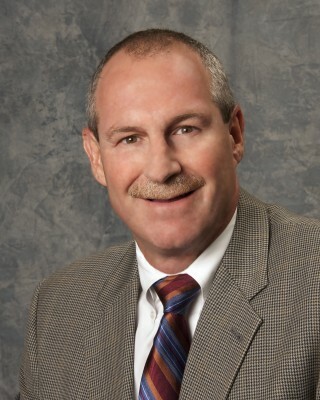 Tom Sadler, CGA, CGP, of Tom Sadler & Associates has been named treasurer. Theme of this year’s Installation and for Jeff’s exciting year ahead, is “Ready. Set. Grow!” Which is exactly what home-building is doing in this community: growing like bamboo! Registration, cocktails and appetizers will begin at 7 p.m. and it’s a sold-out event. The Dallas Builders Association is a professional organization dedicated to promoting new home ownership, industry advancements and community good works on behalf of home builders. The DBA covers a seven-county area of 5,500 square miles with a population of more than 3 million. Its membership includes builders, developers and remodelers in addition to associates — suppliers, vendors and associated businesses and services. The evening will also feature presentation of some of the DBA’s most prestigious awards. 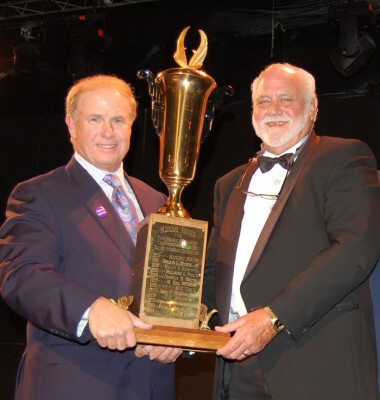 The Hugh Prather Trophy is given annually to the builder, remodeler or developer member who has done the most for the betterment of his/her community and the industry. It is the biggest award given by the Association, named after the founding president (1944). Last year’s winner was Stephen Brooks, CEO of Grand Homes. (In the photo he is being given the trophy by the 2011 recipient John Bynum of KWA Construction.) The Associate of the Year recognizes an associate member’s contributions to and support of the DBA. The AP Roffino Award will be presented to an outstanding division or council. The Shorty Howard Trophy goes to the year’s top membership recruiter. The APEX Award recognizes a builder’s professionalism in doing business with associate members. These awards are named after significant Dallas builders and developers who have made a positive impact on the city. Hugh Prather, who founded the DBA was one of the last surviving icons of the early 20th-century Dallas real estate industry, a former civic leader and a longtime Highland Park resident. He and his father, John Armstrong, were the original developers of Highland Park. His son, Hugh Prather, Jr. died in 2010 at the age of 99. “He was a great force in the early shopping center days,” said Dallas real estate grand dame Ebby Halliday, who served on the North Dallas Chamber of Commerce with Mr. Prather. “In the early days, he was probably one of the handsomest men in town and one of the nicest. Being sworn into office will be the 2013-2014 Board of Directors. At-large directors elected to the Board are Kay Chamberlain, Caprock Custom Construction; Randy West, CGP, Texas Andersen Homes; Tom Greico, Greico Modern Homes; Mark Dann, Highland Classic Homes; Barry Hensley, CGP, MCGP, GSP, Hensley Premier Builders; Chip Chamberlain, RCS, CSP, Caprock Custom Construction; Marc Kleinmann, CGP, MCGP, Bauhaus Custom Homes; Josh LeComte, LeComte Group; Cheryl Turner, Darling Homes; John Todd, CSP, CGR, CGP, CAPS, CMP, Elite Remodeling; Brian Webster, KWA Construction; William Shaddock Jr., The Shaddock Companies; Lisa Carroll, Southwestern Carpets; Kathie Ahrens, CGA, CGP, Arizona Tile; and Doug Beaty, Beach Sheet Metal. DBA directors representing divisions and councils include Dallas Division, Michael Turner, CGB, CGP, Classic Urban Homes; North Dallas/Collin County Division, Tim Lansford, CGA, CGP, Luxury Homes of Texas; Metro East Division, James Nelson, CGA, Alliance Bank, and Phil Smith, Bath & Kitchen Showplace; Denton County Division, Shawn Heiser, Legacy Texas Insurance Services, and Michael Phillips, GSP, ProSource Wholesale Floor Coverings; Remodelers Council, Aubrey Tuggle, CAPS, GSP, Tuggle Designs & Construction, and Greg Loudon, GO Loudon; Multifamily Builders Council, David Tague, Cadence McShane, and Jack Brown, Balfour Beatty Construction. Chairs of certain DBA committees will also serve on the Board. These are: Ambassadors, Bob Hafer, CSP, GSP, MIRM, Ebby Halliday Realtors; Charity Council, Ed Harrison, CGB, GMB, Harrison Homes; Ellis County Builders, David Hill, CGB, CGP, Homes By Hanes; Education, Donny Mack, CGR, CGB, GMB, CAPS, CSP, CGP, Mack Professionals/Beaver Builders; Golf Open, Donnie Evans, Onyx Homes; Government Relations, Frank Murphy, CPA, Wynne/Jackson; HOMEPAC, Rich Messenger, Texas Door & Trim; Integrated Communications, Corey Ford, CGB, Tommy Ford Construction; Membership Development, Joe Chamberlain, CGB, CGP, GMB, Caprock Custom Construction; Membership Retention, Jim White, CGA, CGP, CAPS, Pella Windows and Doors; Nominating Committee, Keller Webster, KWA Construction; Spike Club, Geanie Vaughan, CGA, CGP; and Volume Builders and Developers Committee, Donnie Evans, Onyx Homes. Presidential appointees who will serve on the Board are Earl Williams, CAPS, CGP, CGR, Earl Williams & Associates; Bill Deal, CGA, CGP, CAPS, Bonded Builders Warranty Group; and Larry Baty, Cadenhead Servis Gas. Additional presidential appointees will be announced. The Association’s Honored Life Directors and Past President Life Directors are permanent members of the Board. Newly elected as Honored Life Directors are Pat Ledbetter, Atmos Energy; and Reginald Rembert, Rembert Custom Builders. A complete list of Life Directors can be found on DallasBuilders.com. Saturday Six Hundred:106 Degree Plus Days Got You Down? How Does $250 Bucks Sound for Monthly Utilities –MAX? Not only is this house adorable, well-built, well-located, thoughtfully planned, brand spanking new and close to everything, it’s also the cheapest home you will ever find in Dallas, Texas when it comes to utility costs. Even when it’s 106 degrees. 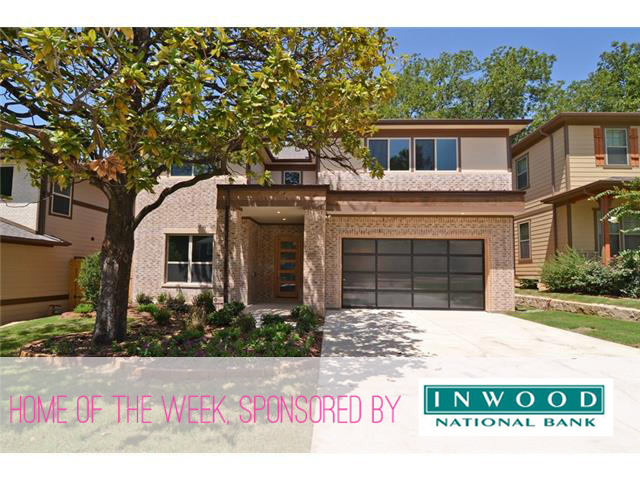 Built by JLD Custom Homes, it’s one of only two local homes whose builders have received the 2011 Oncor Excellence in energy performance award for energy-efficient home building that keeps down costs as well as meets EPA guidelines — a real challenge. Here’s another challenge: the builder of the home, Jeff Dworkin, says he is so confident about the home’s energy-efficient construction he is GUARANTEEING that the buyer’s utility bills will never exceed $250 per month, that’s for both gas and electric, keeping the house at a reasonable temp like 74 to 75 degrees inside. He will do this for a full year. (Right now, the house is empty, utilities are running about $100 a month.) $250 a month for a house this size, 3448 square feet, is worth some buzz. Especially if it’s on the market for $649,995! 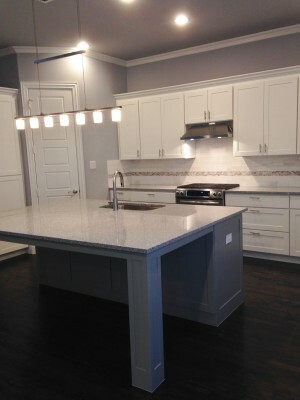 Check out 6911 Gaston Avenue. This home is centrally located and minutes from everything. You want walkable? Even when it’s 104 degrees you’ll have shade here from these things called trees — walkable to the Lakewood Country Club, less than one mile to Lakewood Center and the new Trader Joes, less than a mile to the lake, ten minutes by car to LBJ. The house is on a rare, unique one-third acre lot set back quite far from Gaston, with a two-car garage entrance from Shook Road, behind the home and your gateway to Lakewood fun. In fact, this unique configuration makes 6911 Gaston far more private and secluded because you truly see no neighbors or anyone from the back — just trees! 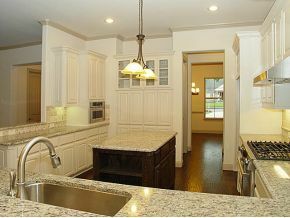 Inside, you have 3400 delicious, well-planned square feet featuring a master and potential extra bedroom downstairs. Yes, you heard me right: possibly two bedrooms down, two bedrooms and a game room upstairs. The builder thought out of the box, for once, and created a versatile living room/study/extra bedroom to the right of the foyer with discrete (but spacious) closets and access to the first floor powder room, which also has a shower. Will someone tell me why more builders don’t think out of the proverbial box? I have begged for years to pop a hidden shower somewhere in my downstairs powder rooms. The entire first floor is covered in hand-scraped hardwoods. There’s a nice dining room, and a laundry/mud room. Kitchen of your dreams — check. 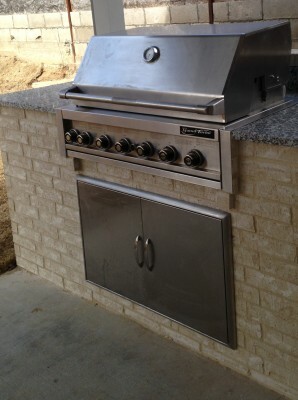 Oh yes pot and pan drawers, KitchenAid Pro Series, granite top of the line, you name it. The builder also added in more handy-dandy cabinet space, a whole wall of it. The laundry/mud rooms feature a granite counter and a writing desk — for those of us who still attend school or keep track of the kiddos, with style. The master — sumptuous: great views of the backyard which has enough square footage for at least one pool and a small water park. The master bath is huge, has a jetted tub and shower, and so much storage you could not fill it in 30 days. Upstairs are two huge kiddos bedrooms and a large jack n’ jill bathroom accessible through the hallway. 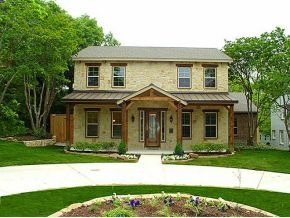 The brick, stone and heavy-gauge metal roof give this home an Austin-y Hill Country flavor. But the best part is that while this house looks OLD, it is brand spanking new and ready to save a family big bucks with hundreds of green, energy-saving tricks. For example, the foam insulation on every square inch — the house is so air-tight they had to add a dehumidifier in the A/C. The home only uses a single, 16 SEER 3-ton unit to cool everything. Even the attic is comfortable in mid July! This house is also open Sunday, July 29, from one to three p.m and I would strongly advise you to take a look/see. 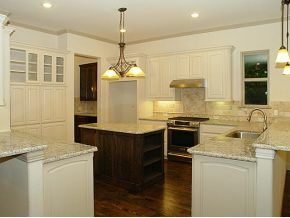 You’ve got to see the solid core bead board doors, great secure windows, and wine cabinet in the kitchen. Even if you are out of town, I’d go home just to check it out. Think I’m kidding? Anyone know how low Lakewood inventory happens to be right now? Lower than my libido, and that’s pretty low –kidding! 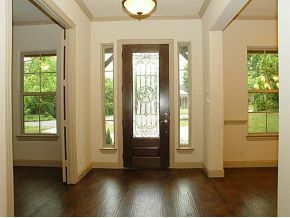 Seriously, we have no inventory, multiple offers are coming in, if you like this house you might just want to POUNCE!